I first encountered chana dal on a takeout menu from an Indian restaurant in University Village near the South Loop. It turned out to be a kind of barbecued chickpea dish, and it was quite delicious. From that, I assumed chana dal was the Indian word for chickpea. And then I saw a bag of chana dal in the Indian grocery store on Devon Avenue. They were much smaller than chickpeas, and they were split in half like lentils. They did have that little bump that chickpeas have, and the same color. Needless to say, a big old four-pound bag of those ended up coming home with me. I soaked about a cup of them for a couple of hours and then cooked them in water. When they were tender, I took a taste. They were delicious - nutty, toasty, and a little sweet. They are more tender and have more depth of flavor than yellow lentils, and they have more substance than red lentils. Red lentils have a place in my culinary cupboard, and I still have more to learn about yellow lentils, I think, but chana dal has become an instant star. I've been watching the new Cooking Channel since it launched last month. Among the many recycled early Food TV shows are some Canadian and British shows, including two that highlight Indian cuisine. I have been watching these shows with great interest, and they have re-sparked my interest in cooking Indian food. 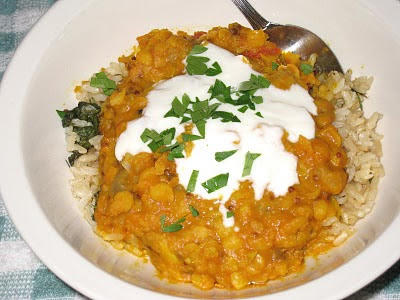 I decided it was long past time I pulled out some seeds and spices and whipped me up a dal. This would work with yellow lentils if you don't have or can't find chana dal. But they are definitely worth finding. cover, and let simmer until tender, about 30 to 40 minutes. medium high heat. Add the onion and cook until it turns translucent. Add the garlic and ginger and cook another minute. thickened. Add coconut milk and cook until warmed through.